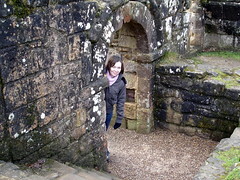 For Dawn's Valentines Day surprise I took her for a day out to Fountains Abbey. We enjoyed rambling about the magnificent ruins and romantic walks in the surrounding water gardens (including a quite scary tunnel! ), before finishing off the day with an afternoon tea in the nearby Ripon. Photos of the day (the majority of which were taken by Dawn) are in the usual place. Permanent link for "Fountains Abbey"
love the photos Dawn especially the one of the Robin.